Perfectly situated in a quiet yet central part of the lovely seaside village of Beadnell and near the beach, Mariner’s Cottage at Beadnell has the perfect coastal feel. Situated within a little collection of exclusive and attractive cottages in the private grounds of historic Beadnell House, Mariner’s Cottage has an open outlook over the historic hall and lawned grounds, and the quaint Church of St Ebba’s. There’s a choice of restaurants and pubs within a short and easy walk, including The Craster Arms and The Beadnell Towers Hotel, as well as the fabulous Salt Water Cafe just opposite Mariners, which is open for breakfast, lunch and dinner. There’s also a village store and a good fish and chip shop on the sea-front. This lovely family-sized cottage also has the added benefit of being suitable for guests who are less mobile, as the ground floor bedroom suite with en-suite wet room has been designed with wheelchair users in mind, there’s even a hoist for hire, if required. For children there is a good selection of toys, books and DVD’s provided and the pretty patio garden is enclosed. There is a village playground with swings, slide, etc. a very short walk from the cottage. There is a travel cot, highchair and stair gate available upon request, along with a range of baby equipment, including bottle warmer, steriliser, etc. Please contact us for a list. Pets are very welcome under our strict house rules, which include them not being permitted on the furniture, or in the bedrooms and they are not permitted to be left unattended in the cottage. The Craster Arms Pub nearby welcomes dogs. PLEASE NOTE: Mariner’s Cottage is lovely cottage and is ideal for guests with limited mobility, as there is level access from the driveway, easy ramp access into the cottage and level access throughout the cottage. The ground floor bedroom has level access through wide patio doors to the pretty patio garden and the wet room means there are no steps up to a shower tray. The cottage has a range of features for our less mobile guests however isn’t adapted for wheelchair users. Although Mariners can accommodate a wheelchair, the doorways are only just wide enough for a standard sized chair. There is a hoist available to hire but you would need to bring your own sling. Please contact us to enquire. The entrance hallway leads into a light and airy lounge. Beautifully styled in coastal hues, it’s very comfortable with a wood burning stove set into a feature fireplace. SKY, Freeview channels and DVD player. Free wi-fi broadband. Feature fireplace with attractive gas ‘real flame’ fire. Selection of books, DVD’s and games. The kitchen is bespoke maple, beautiful and very well equipped. Electric oven with ceramic hob, fridge, freezer, dishwasher, washer/dryer, microwave, kettle and toaster. Tiled floor. Perfectly suited to a couple, children, guests who are unable to negotiate stairs and guests with a disability or wheelchair users (please see notes above). A light and spacious room with twin single beds (full size 3ft wide convertible to a super king size bed (6ft wide) upon request. Plenty of storage and double doors leading directly to the pretty south-facing patio garden. Luxury bed linen and towels are provided. 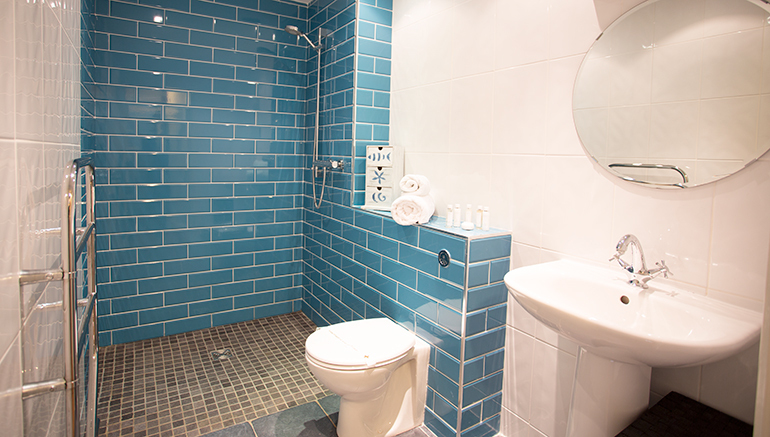 The wet room is adjacent to the bedroom and it offers level access throughout. It is large enough for a wheelchair user to use comfortably and has a walk-in fully tiled shower area, wash hand basin and WC. A spacious and comfortable room with a luxury king size bed and solid oak furniture. Luxury bed linen and towels are also provided. Two small single beds (2ft 6″ wide) convertible to a king size bed (5ft wide) upon request. Luxury bed linen and towels are provided. A luxurious bathroom, fully tiled power shower over luxury bath, WC and wash hand basin. With French windows leading from both the lounge and the ground floor bedroom, this very pretty and spacious patio is south facing to make the most of the sun and is fully furnished with a table and chairs. The patio extends around to the east side and there is also a barbecue. Off road parking for up to 1 car is provided immediately adjacent to the cottage, with a further space a few yards away. There are seats provided in the grounds of the hall to sit outside and enjoy the beautiful surroundings. Full of bright, coastal colours and comfortable, luxurious furnishings, Mariner’s Cottage is the ideal beach retreat to completely relax and unwind. Light and airy but also cosy and comfortable, the lounge is a lovely room to relax and unwind in. The lounge is decorated in gorgeous coastal hues. Relax in fron of the wood burning stove which is set into a feature fireplace. The lounge has plenty of room for the whole family to relax and spend quality time together. The bespoke maple kitchen is well equipped and perfect for any mealtime. Dine in style amongst the coastal hues of the kitchen. Choose from having two full size single beds or a super king bed in this light and spacious bedroom. Luxury beds and bedlinen helps you get a good nights sleep. The wet room is spacious and stylish. Beautifully decorated and furnished with a luxury king size bed, the master bedroom is perfect to unwind in. Complete with dressing table and TV. Opt for twin beds, ideal for children, or the conversion to a super-king-size bed to suit your needs. The family bathroom is luxurious and contemporary, fully tiled and with a power shower over the bath. Up to 6 guests and 1 baby welcome. Welcome Hamper including luxury White Company Toiletries, bespoke Property and Area Guide. Wood-burning stove. BBQ. Free Wi-fi and SKY TV. One double bedroom with a king size bed (5ft wide). 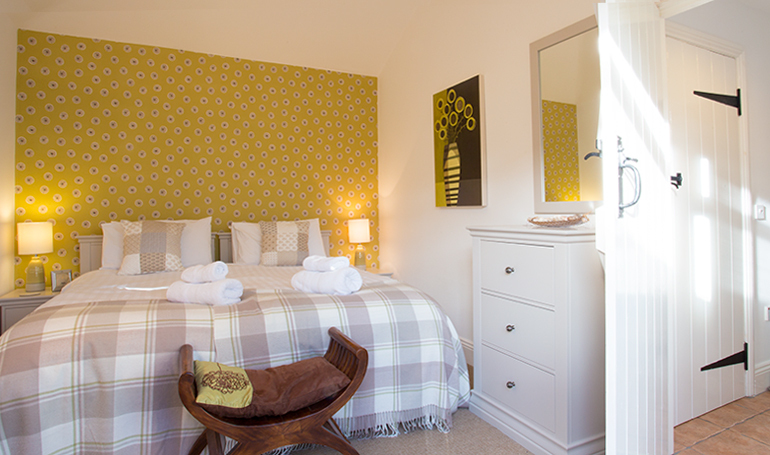 Two twin bedrooms; the ground floor twin room has 3ft single beds that can be converted into a 6ft super-king size bed. 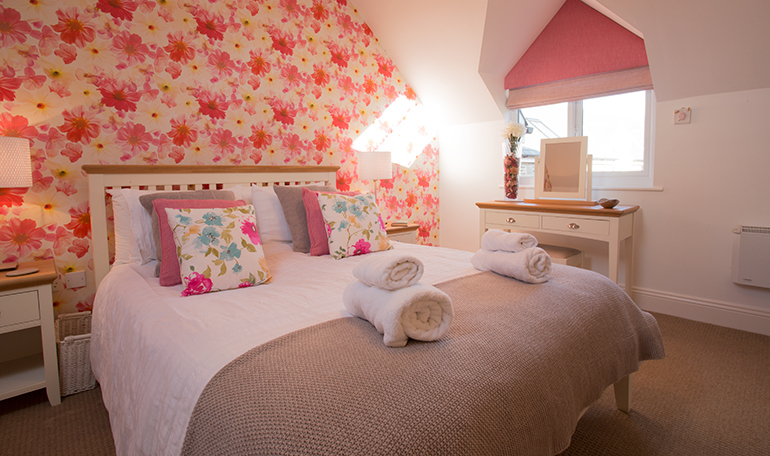 The first floor twin bedroom has 2ft 6″ single size beds that can be converted into a king size (5ft). Hypo-allergenic synthetic bedding and pillows are provided on each bed. There is no alternative available. 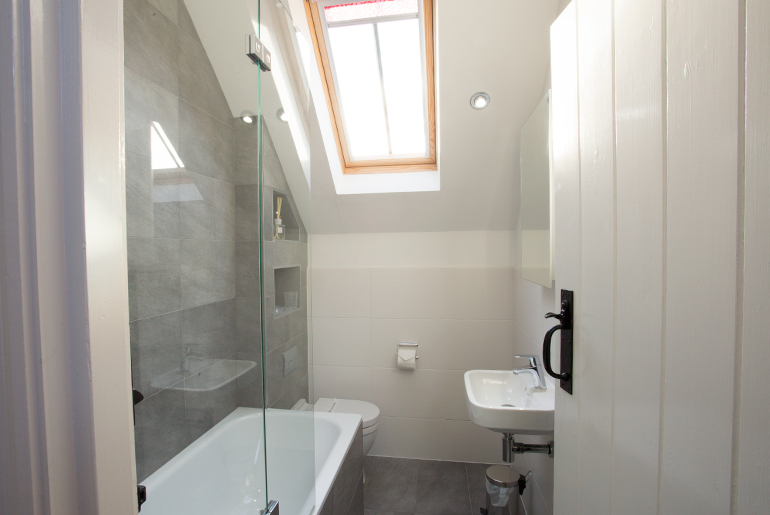 One family wet room downstairs with a WC and basin, suitable for a wheelchair user. The bathroom upstairs ha a shower over bath, WC and basin. Both with heated towel rails. Towels and complimentary luxury toiletries by The White Company provided. With French windows leading from both the lounge and the ground floor bedroom, the pretty and spacious patio garden is south facing to make the most of the sun and is fully furnished with a table and chairs. There is a BBQ provided at Mariner’s all year round. Utensils are provided. Please bring your own charcoal. Please ensure the BBQ is cleaned prior to your departure. Mariner’s Cottage is suitable for our older and less mobile guests and can also accommodate wheelchair users as there is level access throughout the cottage, with a ground floor bedroom and wet room. However, the doorways are only just wide enough for a wheelchair so cannot be deemed as ‘wheelchair friendly’. There is a hoist available to hire for a small charge but you need to bring your own sling. Please contact us if you have any specific requirements and we can advise on exactly what is available. One baby welcome. Travel cot, highchair and stair gate available upon request. Fridge, freezer, electric oven and ceramic hob, dishwasher, microwave, toaster and kettle. Washer/dryer, iron, ironing board and vacuum. Hairdryer, books, music and films. SKY TV. Wood burning stove. Free Wi-fi. TV in the lounge with SKY, Freeview and DVD player, iPod docking station, free unlimited Wi-Fi. Mariner’s Cottage backs onto the garden area of the nearby Craster Arms pub and restaurant and during the warmer months especially, there may be voices heard from people sitting outside. There is occasionally live music or a large screen for major sporting events held in the garden, so please bear this in mind and check the Craster Arms website for details of any events planned for the time you are interested in staying at Mariners if you wish to avoid staying at these times. The doorways are wide enough for a standard sized wheelchair to fit through, but only just. Mariner’s cannot be deemed as fully wheelchair friendly. Please contact us to discuss if the cottage will be suitable for your needs. Here is a floor plan of Mariner’s Cottage, it’s not perfectly to scale and may not include every minor detail, but is provided to give you an idea of the layout. Please contact us by telephone, email or live-chat if you have queries. The huge and sandy Beadnell Bay beach is just a few minutes easy walk away from Mariner’s Cottage and is famous for its wide range of watersports including water-skiing, wind-surfing, scuba-diving and sea kayaking. The excellent Boards and Bikes are based in Beadnell and offers a range of equipment to hire and lessons for young and old. The nearby rock pools will keep children fascinated for hours spotting all the resident sea creatures! Find out more about Beadnell Bay here. The harbour is unique in being the only west-facing harbour on the east coast of England, which benefits from spectacular sunsets. Beadnell is a lovely, peaceful coastal village with a fabulous coastline and is centrally located for exploring. There are 2 pubs in the village, a cafe/bistro opposite the cottage and a little post office and fish and chip shop on the sea front (the latter two are open seasonally). There is so much to see and do within just a few miles drive in all directions, including the fishing port of Seahouses, with its good range of gift shops and amusements and trips to the Farne Islands to see puffins and the largest seal colony in the UK; Bamburgh with its iconic castle and beach; Holy Island, and Lindisfarne Priory, accessed via a 3 mile long causeway at low tide and lots more. To find out the distance of Mariner’s from your own home, how long it will take to drive there and other options for alternative transport, click here: Mariner’s on Googlemaps and enter your home postcode. The postcode of Mariner’s is NE67 5AT. Build quality of the property, internal furnishings and accessories are first class and we were all very impressed. Also the welcome pack was most appreciated as we have not had one in the various places we have had for some years. 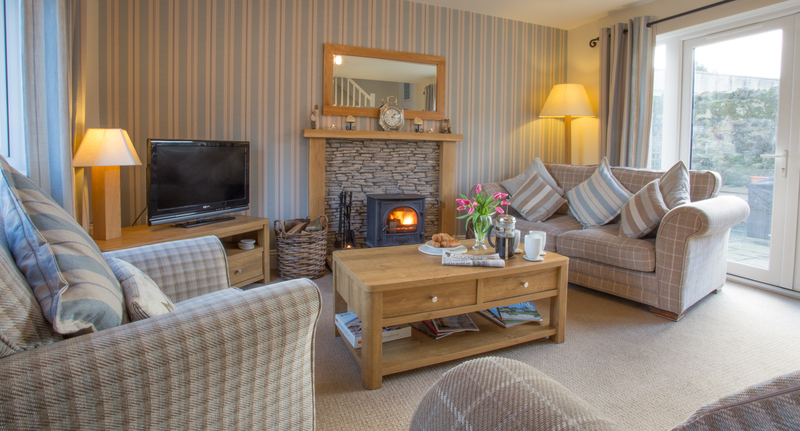 It was our first time with Coquet Cottages but will not be our last! Take a stroll along to Box Pizza, just south of the village and an easy walk. This bohemian courtyard has pretty twinkly lights and colourful seating, serving freshly made pizzas from their pizza oven. It’s something a bit different and an excuse to build up an appetite before dinner! Click here to visit their website to check out opening times. The Salt Water Cafe is a gorgeous new cafe almost opposite the cottage – very convenient! They serve fabulous breakfasts, tasty lunches and open up as a bistro on an evening. They’re fully licenced and serve all local produce using suppliers from nearby Craster, Seahouses and Beadnell. Drive up the A1 to the causeway and visit Lindisfarne Castle and Priory on Holy Island. The Lindisfarne Brewery and gift shop is lovely where you’ll find tasty goodies to bring home with you for friends and family – and for yourself! Please be extra careful and check the tide times for the causeway, and don’t underestimate how fast the tide comes in! It’s a regular occurrence for people to be stranded and have to be rescued by the Coastguard because they ignored the tide timetable and thought they could get through when the tide was coming in – cars flooded with seawater are completely written off! Dine at The Joiners Arms in Newton by the Sea. Just 5 minutes’ drive from the cottage, the Joiner’s Arms is a family-friendly, dog friendly pub and restaurant, serving excellent pub grub and with a great selection of spirits behind the bar for a wee tipple in front of the roaring fire. They also offer takeaway fish and chips if you wanted to stay in but not have to cook. Visit the stunning beaches between Bamburgh and Dunstanburgh Castle. Beadnell Bay is beautiful and great for a summertime paddle and some good old sandcastle building. Head to Newton by the Sea and enjoy the stunning view along the bay with Dunstanburgh Castle in the distance. When passing The Square just before you step down on to the beach, don’t miss The Ship Inn nestled in the corner, it’s unmissable, they have their own micro brewery and are renowned for their famous crab sandwiches! 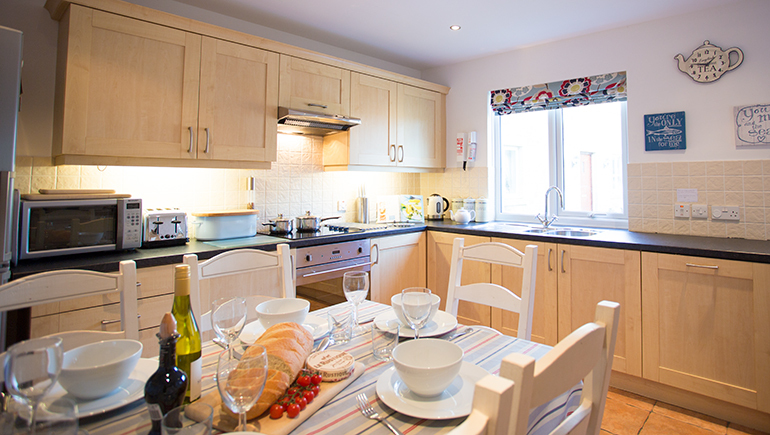 “Welcome to Mariners Cottage a beautifully welcoming home set in the centre of Beadnell Village. We bought the property some 5 years ago, we love the location its perfect for those nice walks on the beach and a stone’s throw away from the pubs for a well earned drink of your favourite tipple! 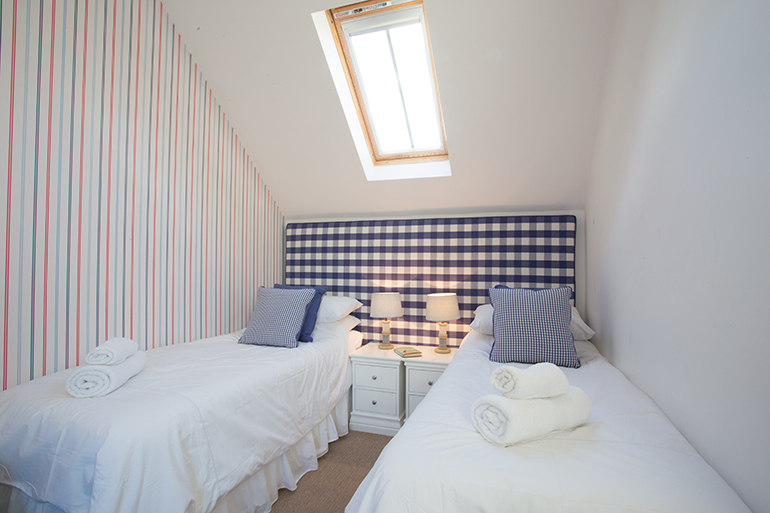 We’ve given Mariners Cottage a beach cottage feel and concentrated on ensuring that people with walking difficulties are able to experience all that Beadnell and the surrounding area has to offer by adding a wet room bathroom next to the downstairs bedroom, allowing everyone to enjoy their time here.